The Arran Coastal Way takes you on an anti-clockwise journey around the coastline of Arran, one of the most beautiful Scottish Islands. Explore remote beaches as you make your way between the small coastal villages. For such a small island, Arran has a great variety of landscapes and geology – the north is dominated by craggy mountains, whilst the south is characterised by rolling lowlands and forests. There’s wildlife aplenty, with red deer and red squirrels, golden eagles above, and basking sharks out to sea. You can also include an ascent of Goat Fell, the highest fell on the island, if you are feeling more adventurous. The island lies on the Highland Boundary Fault which cuts across Scotland and divides the island into to a northern ‘Highlands’ section, and a southern ‘Lowlands’ section, leading to the island being described as ‘Scotland in miniature’. 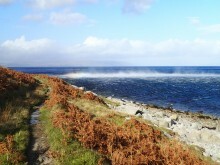 Click here to read about our colleague Lynne’s walk on the Arran Coastal Way. We have a variety of options including walking the whole trail over 5 to 8 days, or doing either the Highlands or Lowlands sections over 3 to 5 days. Make your choice depending on your available time and the pace you find most comfortable. 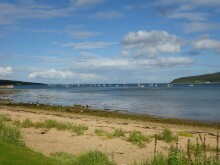 Click on the links below to have a look at the details for each Arran Coastal Way walking holiday. 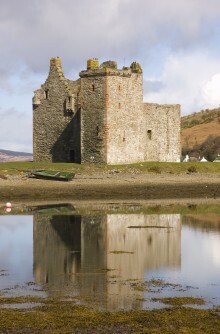 The northern part of the Arran Coastal Way skirts the mountainous part of Arran, with great views over the water to Bute, Loch Fyne, and Kintyre. You also have the option of climbing Goat Fell, Arran's highest mountain. We have 2 options on the northern part of the walk. Start in the seaside village of Blackwaterfoot and follow the rocky shoreline and forestry paths round the south of Arran, before visiting the seaside towns of Whiting Bay and Lamlash. Look out for the dramatic island of Ailsa Craig, further down the Firth of Clyde, and enjoy views over Kintyre. There are 3 options on the southern part of the walk depending on the number of miles you wish to walk each day. Experience 'Scotland in miniature' with Highland fells in the north and undulating Lowlands in the South, as well as secluded sandy beaches around the island. On the route you pass areas of great geological importance (Hutton's Unconformity), a wide variety of wildlife including red deer, golden eagles and basking sharks as well as areas of historical significance (Droon Fort and King's Cave). You have given us a very detailed explanation of the trip so we were well prepared and had a brilliant holiday thanks to that. Brilliant again. We have recommended you to several people en route. We had a great few days walking, made all the better by excellent organisation. Thank you.